The Australian Democratic Socialist Perspective (DSP)is the largest and most vigorous marxist-leninist party in the Australasian region. The DSP ties to Trotskyist, Maoist and "mainstream" communist parties the world over. 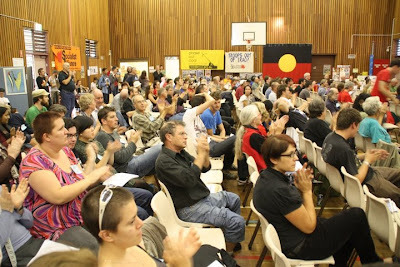 Last weekend, the DSP gathered several hundred comrades in Sydney to plot revolution. Communism is far from dead for these people. They see themselves leading a new wave of revolution, sparked by worldwide economic turmoil and fuelled by "climate change" hysteria. Sydney -- April 18, 2009 -- Several participants at the World at a Crossroads conference, held in Sydney on April 10-12, remarked that the conference could not have been better named. From six continents, 440 socialists, progressive activists and Marxist thinkers gathered to discuss, debate and learn from various struggles for human freedom, dignity and justice. More than 70 activists addressed 42 workshops during the conference. The conference was about creating real solutions to the urgent problems of climate change, economic meltdown and imperialist war. Mere reform of the existing capitalist system will not reverse grinding poverty or halt unpredictable climate change. The path to human liberation requires a radical democracy based on people’s needs instead of corporate profit. The goal must be to fight for a socialism of the 21st century, in Australia and around the world. Mohideen warned that it “would be a dangerous illusion” to think the crisis will mean capitalism will simply collapse. If socialists are to be relevant in the struggle they must “break with dogmas and schemas”. David Spratt, co-author of Climate Code Red: The Case for Emergency Action, said “the obstacles to building a post-carbon society” are not technical or economic but “political and cultural”. “The fact with climate is that, if we don’t solve this, then nothing else will matter”, he said. The task before socialists is “to make the crisis in capitalism become a crisis of capitalism”, he said. The election of US President Barack Obama and the ongoing “war on terror” was the topic of another major session at the conference. Pip Hinman, from the Democratic Socialist Perspective (DSP), rejected the spin from the US and Australian governments portraying the brutal war in Afghanistan as the “good war”. Hinman called for the immediate withdrawal of all Australian troops from Iraq and Afghanistan. The DSP’s aim “has always been to unite as many as possible behind clear anti-imperialist demands”, she said. Two representatives of the Australian Tamil community, Arun Murali and Pramod Devendra, gave a moving talk on the Sri Lankan government’s genocide against the ethnic Tamil population. Sri Lanka spends 45% of its gross domestic product on the war against the Tamils, they said. They called for more solidarity from progressives around the world. “Genocide is happening again and the world continues not just to ignore it but continues to fund it”, Murali said. Tim Gooden, DSP member and secretary of the Geelong and Region Trades and Labour Council, discussed how to draw the workers movement and climate movement closer together. He argued: “Taking up workers’ struggles is taking up climate change. “Capitalism cannot save the planet, and it cannot improve the lives of workers. This part is our job,” Gooden said. 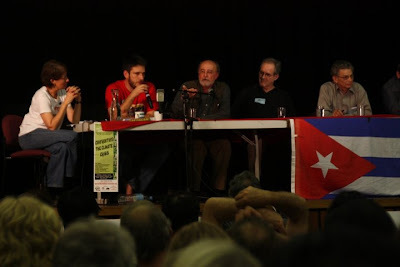 Luis Bilbao, Argentinean Marxist and founding editor of the Latin American magazine America XXI, also discussed the ideas of 21st century socialism, which, he said, are “embodied in entire peoples and movements in Latin America today”. Abelardo Curbelo, a leader of the Cuban Communist Party, and Nelson Davila, the head of Venezuela’s diplomatic mission to Australia, also addressed the conference. The rise of new revolutionary movements across Latin America means “US hegemony in the region has finished”, Curbelo said. The conference celebrated the 50th anniversary of the Cuban revolution and the 10th anniversary of the Venezuelan revolution. Kavita Krishnan, representing the Communist Party of India (Marxist-Leninist), Mericio Juvinal Dos Reis, the executive director of the Luta Hamutuk Institute of East Timor, and Munyaradzi Gwisai, from the Zimbabwe International Socialist Organisation, addressed a session on the growing resistance to neoliberalism in the global South. The conference received greetings from Le Vinh Thu, Director-General of the Department of Southeast Asia, South Asia and South Pacific Affairs, External Relations Committee of the Communist Party of Vietnam.. The final session of the conference was concerned with putting the range of socialist ideas discussed into practice. Canadian socialist Ian Angus, editor of climateandcapitalism.com and a founder of the Ecosocialist International Network, said socialists will “have opportunities to grow far more than previously” in the coming period. M. Saraswathy, the deputy chairperson of the Socialist Party of Malaysia, said that “socialism doesn’t drop from the sky — we have to work for it”. 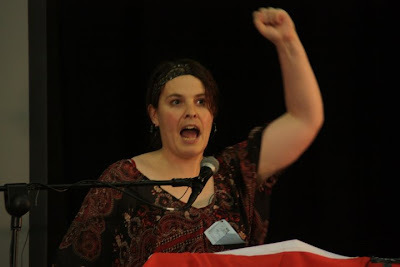 Daphne Lawless, a central committee member of Socialist Worker (New Zealand), spoke out against sectarianism on the left. “We need a socialism of the 21st century that leaves behind socialist identity politics”, she said. Peter Boyle, DSP national secretary, paid tribute to the example of the Venezuelan revolution. He urged continued international collaboration between socialists of varied traditions. “I pledge, on behalf of the DSP, that we will carry on this struggle here in Australia”, he said. Any communists from Chicago there? He was probably busy with his teleprompter> LOL. Are you still a ZAP disciple? This reds-under-beds crap brings back memories of your 80's rants in that hydatids dosing strip known as Christchurch. amazing longmemory how you resort to personal attacks than addressing the bloody issue head on. C'mon kaiwai, even a cursory glance at the material on this site reveals a paranoid anti-Sino theme. Are you people really that worried about the chubby Venezuelan? Welcome to the Chinese century? I really wonder what is the purpose of your posting this stuff, Trev - after all it's hardly a secret what the political affiliations of the individuals involved are, since this report was published in a newspaper which is actively hawked around the major metropolitan centres of Australia! It seeems to me that all you are really doing here is some kind of Judge Clark Brown (he of Boston Legal fame) impersonation, pointing at these people who have the temerity to be openly marxist and revolutionary and declaiming in a shocked voice "Outrageous!" "How dare they!" longmemory: And projecting your cultural outlook onto the Chinese helps you understand the Chinese way of thinking - how? Sometimes when you look at something you might not always get the warm fuzzy information you expect or feel comfortable with. Regarding communism; regardless of the culture there are basic fundamental underpinnings that remain constant regardless of the culture. Quite honestly I see the issue with China is less a matter of communism and more about Chinese nationalism and the use of communism as a narrative to the 'unwashed masses' to justify what ever policy they wish to pursue. Politicians are the same the world over and will use the same sort of borderline religious language to communicate ideological ideas in bite size consumable chunks the masses can digest. Fatal Paradox-What I am trying to do Tim, is broaden awareness of the activities of those who threaten our freedoms. As a man of the left yourself, you know damn well that most people know bugger all about your activities, motivations and connections. Freedom lovers need to know a lot more about their opposition. You may be interested in a very readable text by Ian Johnson (Wall St. Journal) Wild Grass: 3 stories of change in modern China (2004). It examines the state response to Falun Gong and proto-democratic movements in China this century. Instead of demonising China as 'communist' NZers are much better served by analyses that attempt to understand the directions she is going in & how her history influences her future. p.s. My Mandarin is appalling but I'm sticking with it!